Energizer Solar has moved into the consumer electronics space with a new product lineup that pairs Energizer’s trusted batteries with portable solar panels for a system that provides power when you need it, where you need it. Energizer Solar CEO Kevin Magenis was kind enough to have a chat with us about the brand, where he’s taking it, and their bold plans to create a new lineup of products at the intersection of portable solar and storage. 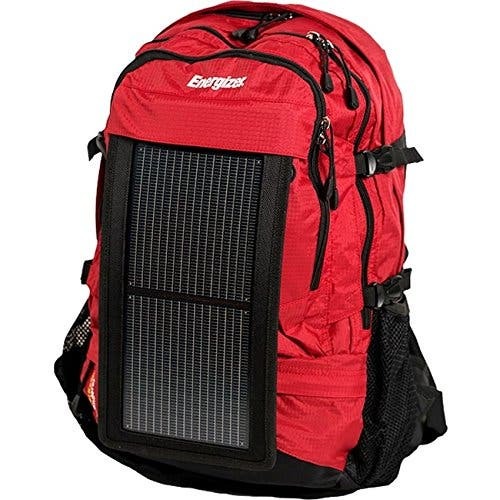 Our paths first intersected over the prospect of a review of the Energizer Solar Powerkeep Wanderer, which brings together a rugged outdoor backpack, a 3 watt detachable flexible solar panel, a 10,000 mAh battery, and a hydration system. It lets people on the go and outdoor enthusiasts keep all their devices charged up … but not like you might think. The pack is designed to use the attached solar panel to charge the portable USB battery that it comes with. This can be done on the go while hiking around in the mountains or by disconnecting the solar panel and battery and setting them up to charge at camp, at home, or at the office — then charging all your devices off of the battery in the evening. It’s a flexible solution that gives owners new functionality and plenty of options to use it in the way that best meets their needs. Kevin, who lives in Colorado, shared that he loves getting out and hiking in the nearby Rocky Mountains, designed the very rugged pack with outdoor enthusiasts in mind. Having said that, as an office warrior who’s more comfortable in a hipster coffee shop than at the top of a 14,000′ peak in the middle of nowhere, I found the pack extremely functional for all my day-to-day needs as well. After spending two weeks with the pack, I was very impressed with how rugged the pack is overall. The padding on the back, the straps, and the pack material are all very well built. It folds the US-built solar panel in seamlessly with a velcro strip along the top of the panel that locks into the pack and two clips at the bottom of the flexible panel that ensure it stays attached. The clips and straps are all rugged and look like they would stand up to years of hard work in the mountains or travelling around the world. In terms of functionality, the panel can charge up the included 10,000 mAh battery in 8–20 hours of sunlight, depending on the quality of light and the angle. This is the main reason I love that the solar + battery system are detachable. For office jockeys, the system can be detached to charge outside the office or in a window. For campers, the system can be left at camp during the day. And for those on the go, you can just leave it on the pack to pick up as much power as possible throughout the day. It’s worth noting that, as with any solar panel, it loses effectiveness when used indoors, so it’s best to charge the system outdoors to maximize power generation. The Powerkeep Wanderer is only one of the many portable solar systems Energizer Solar is working on and really just the tip of the iceberg. Kevin shared that the underlying theme that drives their products is a passion to pair Energizer’s established batteries and battery products with portable solar panels that give consumers more options to charge up and stay charged. Along those lines, the Powerkeep Wanderer backpack and the Powerkeep Pro are the backpack-style packs. The company also makes two kits that pair portable solar with an Energizer battery pack — the PK12 and PK36. These pair a 4-panel folding solar array with a AA battery charger and a 10,000 mAh USB battery, respectively. Kevin shared that the company also has some (much) larger products in the works for early 2018 that will be well suited for situations requiring higher output and/or more energy storage. I asked if Energizer Solar would be developing a stationary residential energy storage product … but alas, it is not to be. The Energizer Solar team believes that batteries allow customers to take their power with them and are sticking to that as a core product design strategy. Pairing them with solar is a natural extension of that ethos, as it extends the functionality of the batteries even further. Kevin was able to share that two “grid enabled” products are in the works that will have grid connection capability and much higher output capability. Several smaller units are also in the works. So, stay tuned as those products are announced and introduced into the market over the next few months. Energizer Solar products make exclusive use of a very stable lithium-ion polymer chemistry that charges fast and has a higher current potential than other batteries in addition to being very safe and stable. The specific chemistry used holds a charge for a year or more, which is impressive given the dropoff many portable batteries experience in just a matter of weeks. Kevin shared that developing a product that’s safe is one of the key focuses of the Energizer team and said that a new chemistry was in the works that the team believed would be even safer than current offerings.